After a year out from the WRC calendar, New Zealand will be the next destination for the WRC drivers. One of the most anticipated rally of the year, New Zealand’s gravel stages are one of the drivers favourite rallies in the championship. In the background, its mountains and valleys provide one of the most beautiful sceneries in the world. In 2008, Sebastien Loeb won his 44th rally, and his 8th of the season after he won the rally ahead of teammate Daniel Sordo. It was a great weekend for Citroen with a perfect 1-2 finish. Loeb’s title challenger, Mikko Hirvonen finished in 3rd place. After the rally, Loeb extended his lead in the drivers’ championship standings from Hirvonen to 8 points. Heading into the 5th round this year, Loeb leads the drivers’ championship standings with 93 points, 40 ahead of 2nd place man Petter Solberg and 41 ahead of 3rd place Hirvonen. It remains to be seen if anybody can challenge Loeb’s supremacy so far in the 2010 championship. 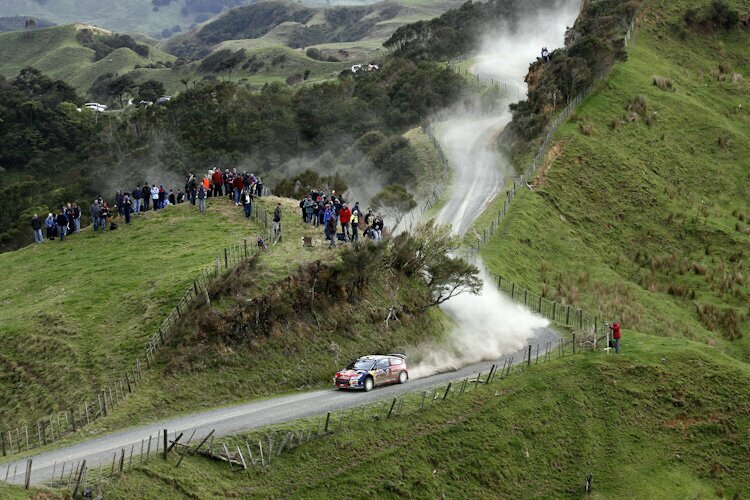 For now, enjoy these breathtaking photos of the Rally New Zealand 2008.